Doesn't seem to work for me. Probably not your plugins fault - more likely a Flex 2 on OS X problem. 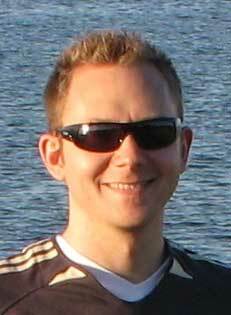 [INFO] Result of flex2.tools.Compiler execution is: '1'. 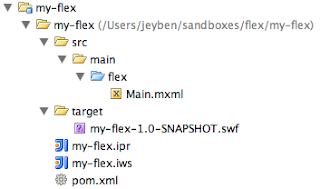 I forgot to mention that you have to uncomment the local-font-snapshot element in the flex-config.xml for the sdk. I have updated the post with information on what to do and it should all work now. Source directory [...]/src/main/flex does not exist. At what time in the process do you get the error? When creating the project from the archetype? or when calling mvn install in the created project? Did you remember to set the -DpackageName= to nothing? If you like you can change the source directory after you have created the project from the archetype. It should not give you any problems. But it is not required that you change the sourcedir. One other thing, can I create an actionScript project with this aswell? and when i try to run mvn install from the root folder containing the pom.xml i get the following error. 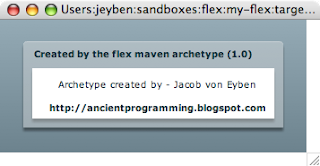 Build Error - Result of flex2.tools.Compiler execution is: '1'. For more information, run Maven with -3 switch. Is it an issue with using flex3 instead of flex2 to compile? Anyway, gr8 work and keep up. It was not an issue. I just put the flex.home path at the wrong place. Sorry for the trouble. It's better if you could delete my previous post. It's working fine now. I would like to know if it's possible to use maven commands from within eclipse IDE? I tried everything upto the install part (Everything worked great uptil this) but when I gave the command 'mvn install', I got the following error. It says that there isn't a pom.xml file when there is actually a pom.xml file. m.xml, but the build is not using one. This plugin is goodness. Worked out of the box with maven2, the flex SDK version 3.0 from Adobe, and OSX 10.5. [INFO] Cannot execute mojo: resources. It requires a project with an existing pom.xml, but the build is not using one.